Objectives: Players to focus on their decision making; develop automatic movement upon passing the ball. Technical/ Tactical- First touch, passing, positioning, managing pressure, creating angles to recieve. Psychological - Understanding of the topic, learning from mistakes, experimenting, players to realise the relevance of the topic. Social - Communication, teamwork, encouragement, praise, enjoyment. -A playing area is split into five separate grids . One player will occupy each of the five grids. One ball required for group of five. -Players pass the ball among themselves. 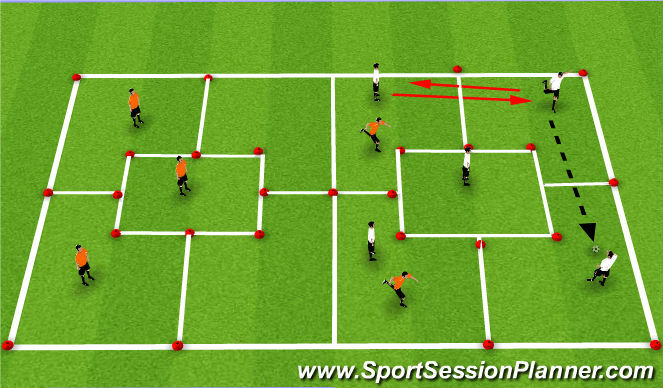 After making a pass, the passer must change grids with another player right, left, or in the center of the area. Players are allowed two touches. 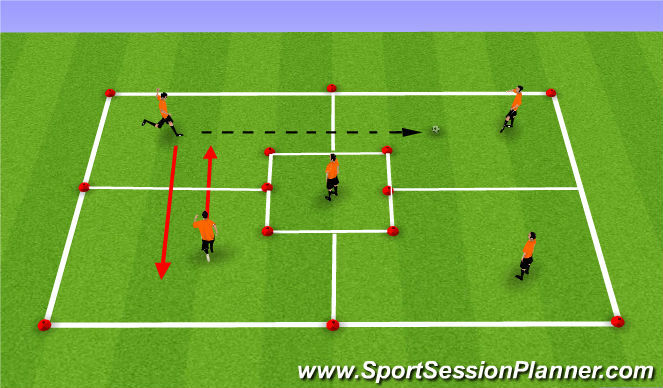 -Add a second group of five players that participate in the same activity with a separate ball. This will increase the pressure without adding defenders. -Players receive the pass across their body in order to see the entire playing area. -Regardless of movement, players should always be looking towards the centre of the area and be able to see the ball to increase awareness and speed of play. - Depending on number of players, add a third group and create a larger playing area for all participants. -Each team is separated into their own five zone area. -The white team maintains possession in their own five zone area while two orange defenders move into the playing area. At this point the game becomes 5 vs. 2. -The white player who makes the pass must change positions with any other white player; always maintaining the balance of only one player in an area. -The white team maintains possession for as long as possible. 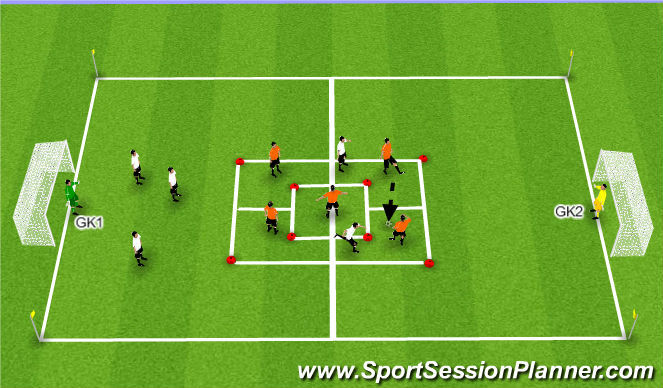 Once the orange team wins possession, they play across to their team and two white players move across to defend. -When maintaing possession, always stay open to the field. Receive the ball across your body as much as possible. -As you move into another area, always be able to see/ show for the ball. -Mental recognition to always move after you pass. - Add a third defender creating a 5v3 situation. - Decrease the size of the pitch, enforcing players to focus on their first touch, whilst thinking about who they&apos;re passing to before recieving the ball. -Orange keeps possession for five consecutive passers. The orange passer must change positions with a teammate after each pass. -If necessary, the orange can pass back to GK2 to maintain possession, but this pass does not count towards the five required passes. -After five passes are made the orange team attacks GK1 playing 5 vs 5. At any point if the defending team gain possesion they can counter through the 2 remaining attackers and score the opposite end. If they score, teams change roles. -Players recieve the pass across their body in order to see the entire playing area. -Regardless of movement, players should always be looking towards the centre of the area and in a half turn position. -In order to maintain possession, advise players to look at a range of passing such as short and angled. -Once the attacking team creates five passes, attack at speed to potentially overload.